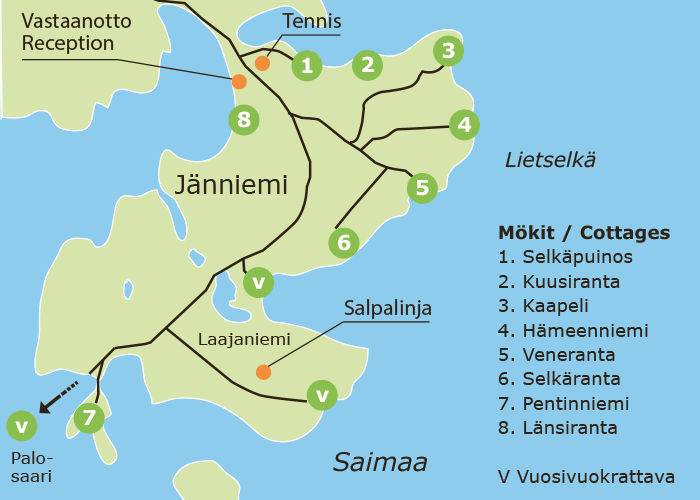 Our cottages are located on an idyllic headland in the most enchanting Lake Saimaa settings. As can be seen from the map, all properties are situated a good distance from each other, which means that tranquillity is part of the package. There is an abundance of pleasant forest paths and trekking routes in the area. All cottages are supplied with a rowing boat, at no extra charge. The surrounding countryside, Lake Saimaa, and the pine scrubs of Jänniemi offer a wealth of opportunities for invigorating outdoor activities. When you want to go faster than strolling pace, bicycles, motorboats and all-terrain vehicles are available. Those with an interest in history might wish to acquaint themselves with the locations of the wartime Salpalinja (Salpa Line) bunker line and fortifications, which are still visible in the area. For Midsummer celebrations, there is a location on a rocky section of the shoreline, ensuring both visibility and safety for the Midsummer bonfire. Enjoying the great outdoors is possible in all seasons! We can provide our residents with rod permits for the whole area, and net fishing permits for within the Lietvesi area. Locally plentiful species are pike, perch/bass, pike-perch, freshwater trout, bream, whitefish, and vendace. Rowing boats are provided free of charge at all cottages, and motor boats are available for hire for lengthier fishing trips. The distance to the nearest shop, in Hurissalo, is about 6 km. Sahanlahti and the village church restaurant services in Puumala, Anttolanhovi restaurant, and Ollinmäen Viinitila (Ollimäki Vineyard) in Mikkeli.